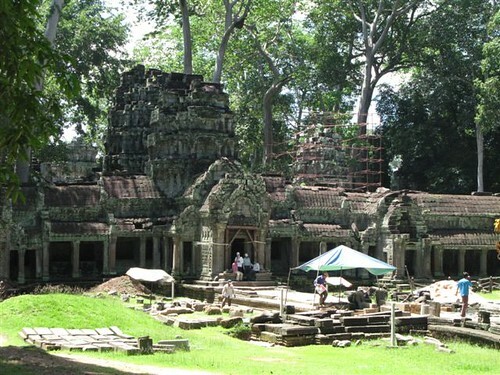 …plus a few more temples thrown in, not even a fraction of the supposed 100 temples in the 400 kmÂ² area. 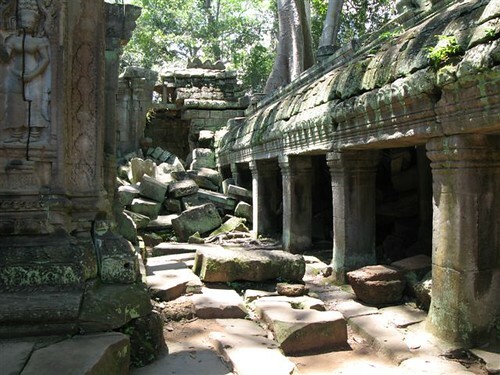 It was French explorer Henri Mouhot who brought Angkor to the world’s attention in 1860. 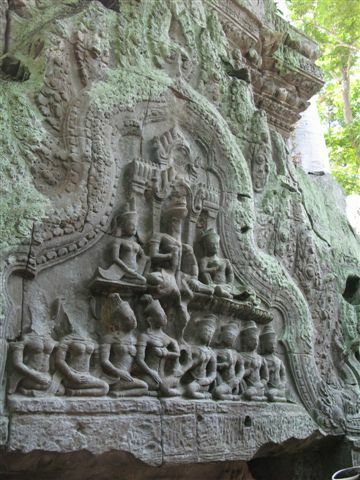 The creation of Cambodia’s King Suryavarman II (reign: 1112-1152), he built it to serve as his holy capital and later on, his funerary temple. 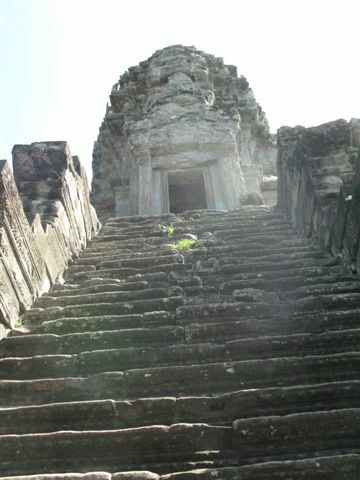 The temple, considered the largest Asian pyramid, is in the center of a man-made moat, and is surrounded by a laterite wall. Rising at 42 meters above its base and angling at a steep 70 degrees, the centerpieces of the temple are the now-famous five towers, each representing the celestial peaks of Mt. 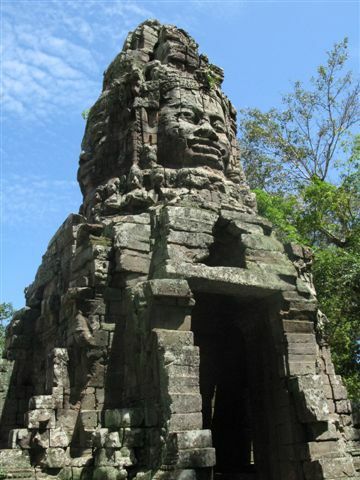 Meru, the tallest tower of which represents the home of Vishnu, the Hindu god and preserver of the universe. (It all sounds so utterly profound). My sisters and my mom and I hire a tour guide, Jack, who takes us around the entire temple. 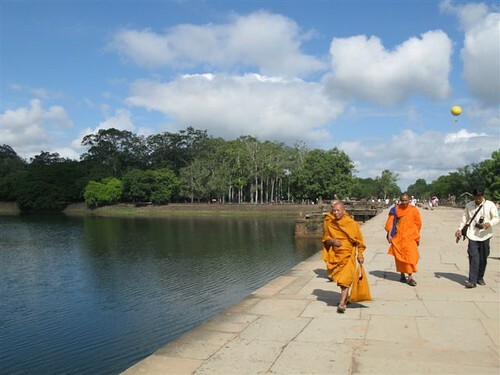 He tells us that in Cambodia, being a tour guide of the Angkor temple complex is quite prestigious, and the preparation is stringent, requiring up to six months of study (both in the history [of the temples] and speaking the English language) plus there are three major tests to hurdle. 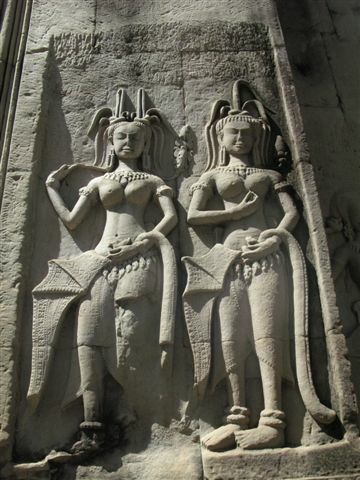 I was told that in the entire Angkor Wat, this is the only apsara that shows her teeth. Incredible! 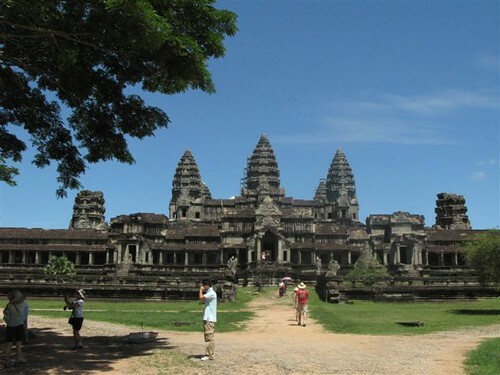 The five inter-nested rectangular walls and moats of Angkor Wat symbolize chains of mountains and the cosmic ocean. 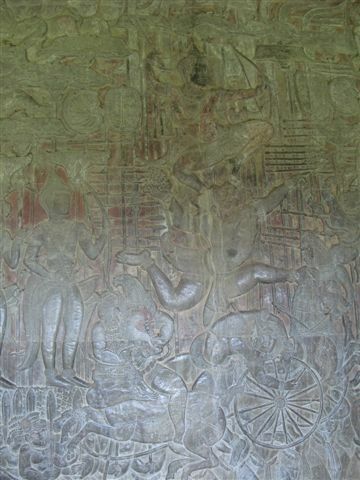 The most famous decorations here are the apsara, heavenly nymphs or angelic dancers, of which there are 1,876 of them painstakingly carved into the walls. 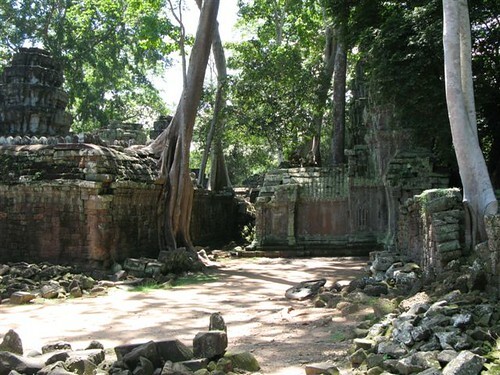 Beyond the central temple’s eight meter-thick walls are some of Angkor’s most significant monuments. 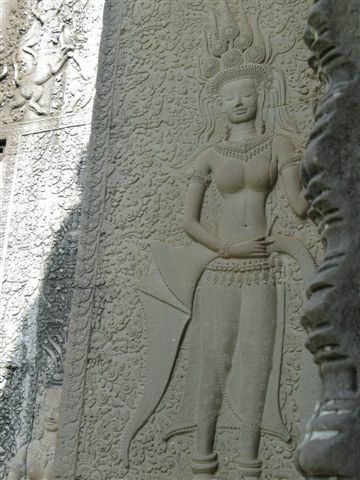 In the Bayon, the King’s state temple, are intricate bas-reliefs and over 200 large faces adorning the Bayon’s 54 towers. 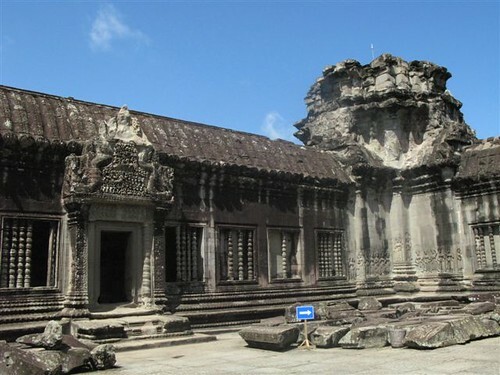 The temples are breathtaking, absolutely awe-inspiring. 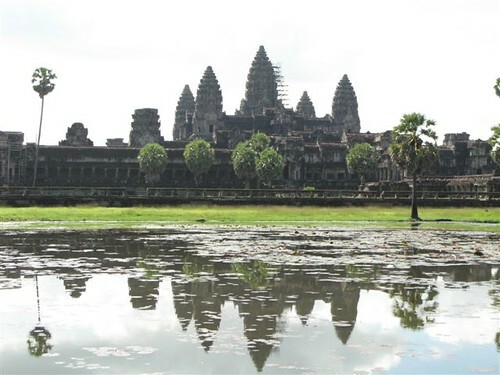 I can’t even find sufficient adjectives to describe the astonishment and wonder that envelops me as I gaze at one of humankind’s most enduring architectural feats and Cambodia’s national symbol of ardent pride. 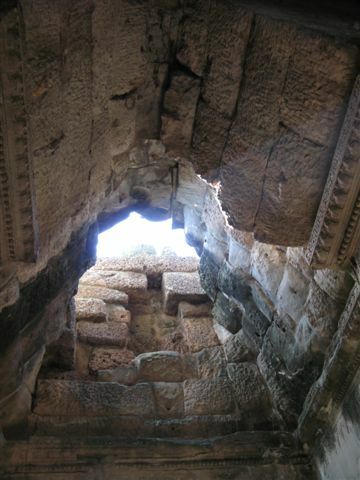 There are some areas of the temple that are closed to visitors. Restoration projects, most of which are spearheaded by France, are being done to preserve this walled legacy for future generations. 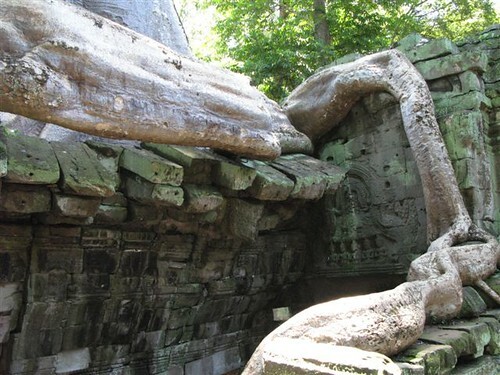 Built in the later part of the 12th century by Jayavarman VII, Ta Prohm has been left as it was found, untouched by any kind of restoration. 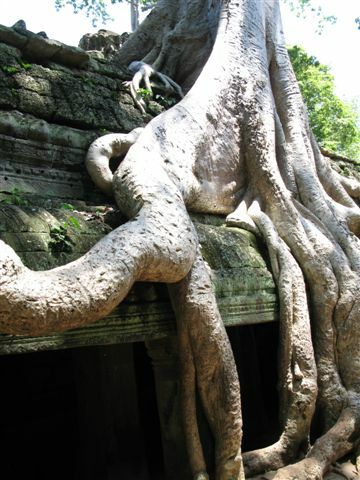 The entire temple, a progression of galleries and haunting entryways, has been strangle-gripped or whatever you want to call it by enormous trees that loom into the skies. 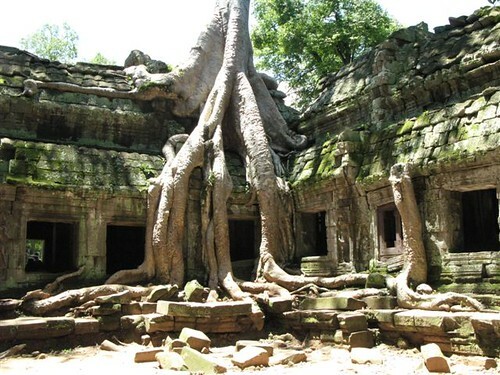 The trees, themselves centuries-old, weave and wind their way through the ancient stones like a serpent, sometimes straddling themselves on mountains of rock. 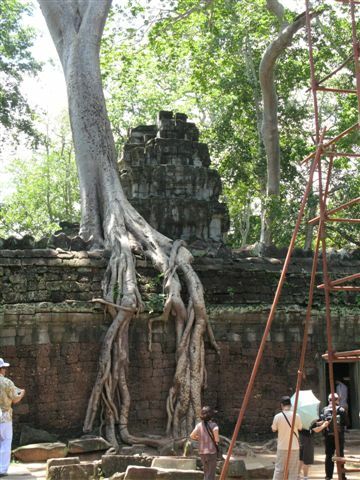 Again, the sight and the emotion wrought by not knowing where man ended and nature took over (or is it the other way around?) can’t be described. 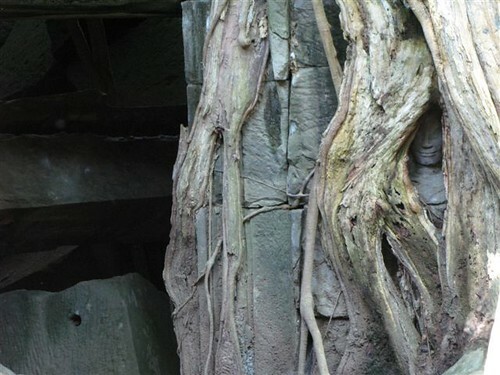 can you see the eerily smiling face in this photo? Is Borobudur not considered a pyramid for some reason? Hi Lori! Nice blogs once again. You’re one of the few people who convinces me to save my euros for travels as opposed to purchasing designer bags that only myself can enjoy. What happened to Part 3? 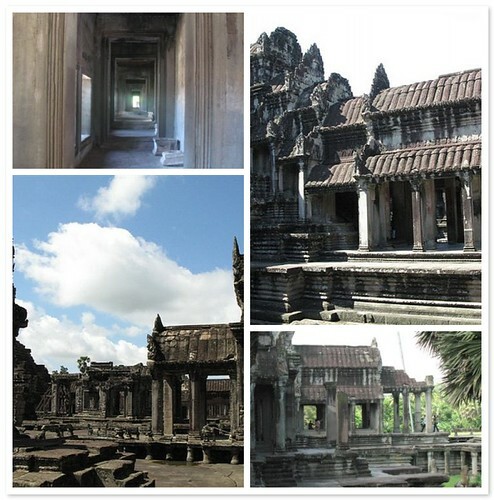 I love your pics–I’m going to Cambodia in December, and am doing research! I love the little food tidbits. I’ll be in Manila in March, so your blog is like my little food travel guide!